Lexus is in the unique position of offering the North American luxury market two premium sedans nearly identical in size and more or less the same shape, within an auto sector that’s shunning four-door three-box designs faster than you can say SUV. 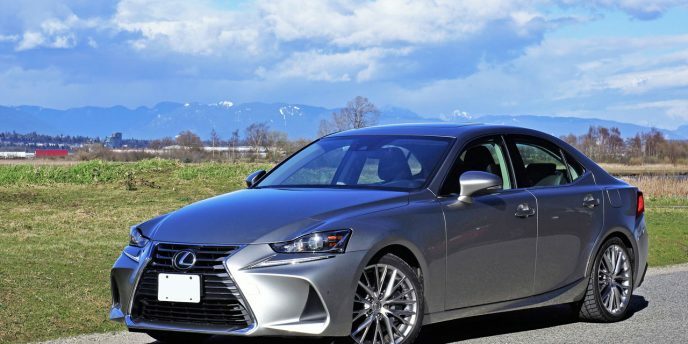 Rather than nix at least one of them like so many of its rivals are doing, the preeminent Japanese luxury brand soldiers into 2019 with the sportier and more upscale GS 350 AWD, unchanged since 2015, and the ES 350 and ES 300h hybrid completely redesigned for its seventh generation, this latter set of models hot on the heels of the all-new fifth-generation Toyota Avalon that shares underpinnings. No matter whether trimmed out as a base ES 350, upgraded with more athletic ES 350 F Sport duds, or delivered in classy as-tested ES 300h guise, Lexus’ front-drive four-door now adds an entirely new level of visual drama to its outward design. Its trademark spindle grille is larger and considerably more expressive, its origami-inspired LED headlight clusters more complex with sharper edges, its side profile longer and sleeker with a more pronounced front overhang and a swoopier sweep to its C pillars that now taper downward over a shorter, taller trunk lid, while its rear end styling is more aggressively penned due to a much bigger crescent-shaped spoiler that hovers above expansive triangular wrap-around LED taillights. The overall design toys with the mind, initially flowing smoothly from the grille rearward, overtop the hood and down each sculpted side, but then it culminates into a clamor of dissonant creases, folds and cutlines at back. Still, it comes together quite well overall, and certainly won’t conjure any of the model’s previous criticisms about yawn-inducing styling. Similar can be said of the interior, but instead of sharp edges the cabin combines myriad horizontal planes and softer angles with higher-grade materials than the outgoing ES, not to mention a few design details pulled from the LFA supercar, particularly the black knurled metal pods hanging off each side of the primary instrument hood, the left one for turning off the traction control, and the knob to the right for scrolling between Normal, Eco and Sport modes. Between those unorthodox pods is a standard digital gauge cluster that once again was inspired by the LFA supercar and plenty of lesser Lexus road cars since, while the infotainment display at dash central measures a minimum of 8.0 inches up to a sizeable 12.3 inches, yet both look even larger due to all the extra black glass bordering each side, the left portion hiding a classic LED-backlit analogue clock underneath. Better yet, when opting for the as-tested ES 300h hybrid the infotainment interface now comes standard with Apple CarPlay for those who’d rather not integrate their smartphone via Lexus’ proprietary Enform system. This said Enform is arguably more comprehensive and easier to use than Android Auto, which is not included anyway, while standard Enform 2.0 apps include info on fuel prices, traffic incidents, weather, sports, and stocks, plus it’s also bundled with Scout GPS Link, Slacker, Yelp, and more. The 2019 ES 300h also gets an updated Remote Touch Interface trackpad controller on the lower console, which allows gesture controls like tap, pinch and swipe, while other standard features include 17-inch alloy wheels, Bi-LED headlamps, LED taillights, proximity-sensing keyless access with pushbutton ignition, a leather-wrapped steering wheel, rain-sensing wipers, an auto-dimming rearview mirror, a rearview camera with dynamic guidelines, 10-speaker audio with satellite radio, a deodorizing, dust and pollen filtered dual-zone automatic climate control system, 10-way powered front seats with both three-way heat and ventilation, NuLuxe breathable leatherette upholstery, all the usual active and passive safety equipment including 10 airbags, plus much more. Safety in mind, the new ES 300h comes standard with the Lexus Safety System+ 2.0 that features an autonomous emergency braking pre-collision system with pedestrian and bicycle detection, plus lane departure alert with steering assist and road edge detection, new Lane Tracing Assist (LTA) automated lane guidance, automatic high beams, and full-speed range adaptive cruise control, all for just $47,000 plus freight and fees, which is only $2,000 more than the conventionally powered base ES 350. The aforementioned 12.3-inch infotainment display comes as part of an optional $3,800 Premium package that also adds blindspot monitoring with rear cross-traffic alert, reverse tilting side mirrors, front and rear parking sensors, a heatable steering wheel, front seat and side mirror memory, navigation with extremely detailed mapping, and Enform Destination Assist that provides 24/7 live assistance for finding destinations or points of interest. Alternatively you can opt for the even more comprehensive $10,600 Luxury package that combines everything from the Premium package with 18-inch alloy wheels, Tri-LED headlamps, Qi-compatible wireless smartphone charging, full leather upholstery, and a powered rear window sunshade. Instead, the as-tested $14,500 Ultra Luxury package builds on the Luxury package with unique 18-inch noise reduction alloy wheels, ambient interior lighting, a 10-inch head-up display, a 360-degree surround parking monitor, 17-speaker Mark Levinson premium audio, softer semi-aniline leather upholstery, rear door sunshades, and a touch-free gesture control powered trunk lid. 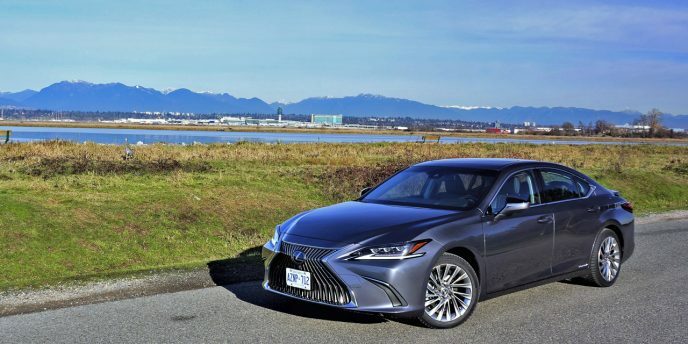 By the way, to get all 2019 Lexus ES 350 and ES 300h pricing details including trims, package and options, plus important rebate information and dealer invoice pricing that could save you thousands, be sure to visit CarCostCanada. I don’t know about you, but I’m getting a bit weary of all the news saying that cars are dead and SUVs now rule the road. The fact is, well designed cars that deliver good value still have a strong following in Canada, a point proven by the Honda Civic, Toyota Corolla, Mazda3 and Volkswagen Golf in the mainstream volume compact class and the Mercedes-Benz C-Class, BMW 3 Series, Audi A4, Acura TLX and Lexus IS in the compact luxury D-segment. All of these cars actually grew their year-over-year sales in calendar year 2017, something that can’t be said about the Infiniti Q50 and Cadillac ATS. To be fair to Infiniti, when combining sales of its Q60 Coupe with the Q50, deliveries were actually up last year, which is also true for the IS and Lexus RC coupe, despite the latter being slow to move off dealer lots, while ATS sales numbers include both sedan and coupe models (like Mercedes does with its C-Class sedan, coupe and convertible), and showed a much deeper year-over-year decline. Aiding last year’s IS series sales success was a dramatic refresh for the 2017 model year, this being the first significant update since this third-generation model was completely redesigned for 2014. 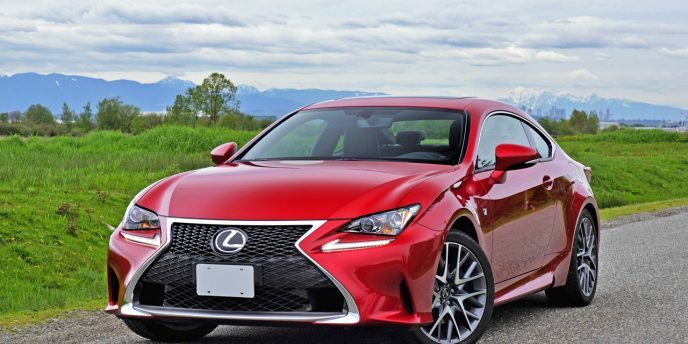 F-Sport trim already boasted a fairly aggressive front fascia as seen in my 2014 and 2016 IS 350 F-Sport reviews, but last year’s update made it more akin to the RC F Sport, which left room to beef up the non-F Sport trimmed IS 200t and IS 300 AWD models. The result is a look that might even be more eye-catching than the previous F Sport model, with Lexus’ trademark spindle grille growing in size, the headlamps reshaped to a simpler design and equipped with standard LEDs, and the lower front fascia now much bolder thanks to larger, deeper and considerably more pronounced corner “brake” ducts. That these faux vents only look cool is a shame. Rather than forcing cooling air onto those brakes, these aero detractors actually create wind resistance, but it’s possible some increased downforce enhances high-speed handling. The checkmark-shaped LED driving lights remain unchanged, as do the car’s swoopy bodyside panels the sweep upward in dramatic fashion before tapering off over the rear wheel cutouts, but the seemingly identical LED taillights receive new lenses and innards. Lastly, a slightly reworked matte black diffuser-like lower bumper cap features new angular tailpipes, doing their part to modernize the rear end design. As noted in last year’s IS 350 AWD F Sport review, I’m not willing to say that Lexus’ bigger and bolder design departure necessarily translates into better, but some of the changes made are noticeable improvements, particularly inside where gorgeous new light on dark laminated wood inlays decorate the dash front and door switchgear panels. The IS has always provided good perceived interior quality, with soft touch composites in all the expected places, nice tastefully applied metallic accents throughout, mostly high quality switchgear, and particularly good digital displays, despite this less expensive model not featuring Lexus’ fully configurable gauge cluster found in last year’s pricier alternative. Audi fans might find the look a bit cluttered, Lexus preferring an origami-inspired multi-angle interior design to match exterior styling, rather than anything organically grown. Consider it the Nakamichi Dragon of instrument panels, with lots of little buttons, knobs and toggles atop a hard-edged black metal and composite structure, the infotainment system’s unique albeit somewhat archaic joystick-style controller also seeming to try and take us back to the days of cassette decks and turntables. If you used Lexus’ Remote Touch Interface in the past and haven’t tried it in a while, take note that it’s improved a lot. Side buttons for selecting functions were added a few years back, eliminating the frustration of having the joystick slip off course when pressing on top, and the system’s haptic response, which feels as if it’s locking onto a given link as the curser passes over, isn’t quite as grabby. Most people seem to like this setup better than RTI 2.0, which is a lower console-mounted touchpad design laid out in quadrants, this found on some other Lexus models, but I’d much rather have the display screen moved closer and a straightforward touchscreen installed. Toyota, Lexus’ parent company’s namesake brand, does a great job with its touchscreens, plus its new Entune system is fabulous (Lexus Enform, which is basically the same thing, is currently only available on the 2018 NX, RC, RC F, LS, and LC), so I’m looking forward to Lexus saying goodbye to all of these creative controllers and delivering a much simpler RTI 3.0 soon. As noted the actual display is superb, and was upgraded from the standard 7.0-inch screen to 10.3 inches thanks to the addition of a $4,850 Luxury Package that also added accurate navigation and a single in-dash DVD player (yes, another throwback to yesteryear) to the infotainment system, plus 18-inch alloys on 225/40 front and 255/35 tires (replacing standard 17s that look a bit small on this car), adaptive cornering headlamps, a powered steering column, a heatable steering wheel rim, ventilated front seats, driver’s seat memory, auto-dimming side mirrors with memory, front and rear parking sensors, a powered moonroof, a powered rear sunshade, and blindspot monitoring with rear cross-traffic alert. This was all added to my otherwise base IS 300 AWD, which other than a standard backup camera comes outfitted identically to the rear-wheel drive IS 300 (that strangely doesn’t have one), including the aforementioned LED headlamps that are also auto-leveling, plus proximity keyless access, pushbutton ignition, a leather-wrapped multifunction steering wheel, paddle shifters, rain-sensing wipers, a windshield wiper de-icer, a great looking analogue clock, filtered dual-zone auto climate control, 10-speaker AM/FM/CD/MP3/WMA audio, USB and aux ports, Bluetooth phone connectivity with audio streaming, satellite radio, Siri Eyes-Free, an auto-dimming rearview mirror, a HomeLink garage door opener, heatable eight-way powered front sport seats with vertically powered headrests and powered driver’s lumbar support, NuLuxe (pleather) upholstery, stainless steel scuff plates, and 60/40 split-folding rear seatbacks expanding on the smallish 306-litre (10.8 cubic-foot) trunk. All IS trims receive the usual assortment of safety features as well, plus a knee airbag for both front occupants, rear side-thorax airbags, and finally the Lexus Safety System+ suite of advanced driver assistance systems, which adds a Pre-Collision System featuring forward collision warning with autonomous emergency braking, lane departure alert with steering assist, automatic high beams, and dynamic radar cruise control. The result of Lexus’ focus on safety is IIHS Top Safety Pick status, minus the best-possible “Plus” rating, while the NHTSA gives it a five-star safety rating with extra notes saying that it’s had zero complaints, zero investigations, and zero recalls. Another difference between RWD and AWD IS 300 models is the chosen transmission, the RWD model getting a sophisticated eight-speed automatic and this AWD version making do with a less appealing (at least from a marketing perspective) six-speed autobox. The eight-speed unit includes quicker shifting Sport Direct Shift Control too, transmission technology originally designed for the IS F, although the six-speed is a Super Electronically Controlled Transmission (Super ECT), whatever that means. Suffice to say that one is built for comfort and one for speed, with the AWD model getting smooth, linear response to input, but not the fastest shift interval times. This brings us to the real meat of the IS 300 RWD/AWD issue, the former actually being last year’s IS 200t with a new name. Isn’t that sneaky? The only difference between the 2017 IS 200t and the 2018 IS 300 is the badge on the trunk lid, being that both have identical 2.0-litre four-cylinder engines making 241 horsepower and 258 lb-ft of torque. Oddly, while the IS 300 AWD being tested here includes a carryover 3.5-litre V6, output has been bumped by 5 horsepower to 260, with torque remaining the same at 236 lb-ft. And yes you read that right, the little turbo-four makes an additional 22 lb-ft of torque, plus max twist arrives 350 rpm sooner within the rev range at 1,650 instead of 2,000. Both engines get direct injection and Lexus’ Dual Variable Valve Timing with Intelligence (VVT-i), and have a reputation for quality and dependability. As you can likely imagine the smaller engine is better on fuel, its Transport Canada rating claimed to be 10.6 L/100km in the city, 7.3 on the highway and 9.1 combined, while the V6 gets an estimated 12.3 city, 9.1 highway and 10.9 combined. 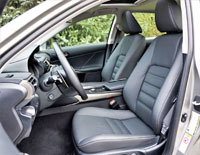 While the base IS 300 seems like the better choice on paper, it will really come down to personal preference and/or price, with the RWD model starting at $41,050 and the AWD version hitting the road at $43,600, plus freight and fees of course, these prices found at CarCostCanada.com, along with important information about possible rebates and even invoice pricing that can save you thousands when purchasing. Seat of the pants differences include a sportier, edgier, lighter weight feel from the IS 300 RWD compared to a smoother, more refined, and arguably more premium experience in the IS 300 AWD, with the latter also delivering a more satisfying exhaust growl. Still, while the AWD model comes across as a bit less enthusiastic, it’s nevertheless a sporty sedan that’s plenty of fun to charge down a deserted side road and throw into a fast-paced corner. You’ll be more likely to do that mid-winter in the AWD version as well, which might be reason enough to choose the 70-kilo (154-lb) heavier model—the IS 300 RWD weighs in at 1,625 kg (3,583 lbs) and the as-tested IS 300 AWD hits the scales at 1,695 kg (3,737 lbs). Another alternative that deserves mention is the IS 350 AWD noted earlier. It remains at the top of this car’s trim echelon, hefting an identical curb weight to the IS 300 AWD and powered by the same 3.5-litre V6, yet making 311 horsepower and 280 lb-ft of torque. It starts at a reasonable $53,100 and comes standard with many of the same features that were optional on my IS 300 AWD tester, so it’s worth a look if you’ve got your eye on an IS. Purchasing in mind, Lexus is no longer at the top of some third-party quality indexes, with the most recent 2018 J.D. Power and Associates U.S. Initial Quality Study (IQS) placing Hyundai’s luxury division Genesis in the lead and Toyota’s luxury division improving on last year’s best of the rest score (below average at 15th overall and sixth amongst 14 luxury brands) to eighth overall and fourth amongst luxury brands. Keep in mind that J.D. Power “quality” factors are murky at best, being that quality has as much to do with complaints about owners’ difficulties using infotainment system interfaces as cars breaking down at the side of the road, yet an improvement of 11 points, which resulted in Lexus’ sole two-digit (99-point) score, makes it number one overall in the same firm’s 2018 Vehicle Dependability Study (VDS), which also means it’s no longer tied for first place with Porsche. Consumer Reports annual reliability survey (fortunately renamed “Annual Report on Car Performance, Reliability, Satisfaction & Safety”) rated Lexus number one last year, but like J.D. Power, that lead was trumped by South Korea’s Genesis for 2018, with the Japanese brand actually falling all the way down to fourth behind Audi and BMW. This said the study includes experiential road test analysis from their own team of reviewers, information that is hardly data driven and therefore has nothing to do with reliability. 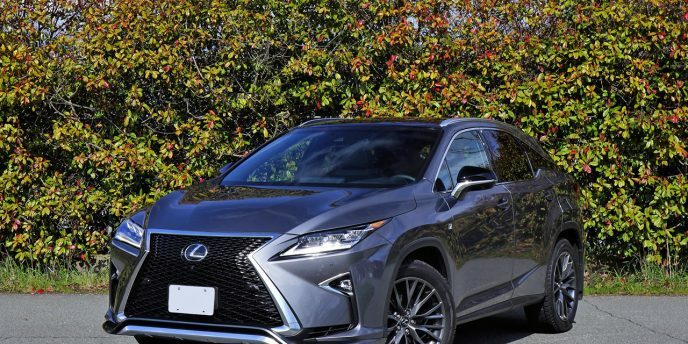 There are other studies that rank Lexus first or close to it, especially when dependability is the core criterion being compared, so suffice to say it’s one of the safer bets when it comes to short and long term reliability. As for resale values, the IS ranked second in the 2017 Canadian Black Book Best Retained Value Award’s “Entry Luxury Car” category, but it didn’t make the top three for 2018 (the ES ranked third in the same category this year). The Mercedes CLA was first, incidentally, a smaller car that doesn’t directly compete with the IS, while the Volvo XC70 was second, this being a discontinued crossover wagon that really can’t be considered entry-level luxury as it was sized larger and priced higher than the more comparative V60 Cross Country, their true entry crossover wagon. More specific to the IS, there’s no reason to think this 2018 model’s resale value will be any weaker than it was when it placed second last year. After all, the 2018 Lexus IS delivers strong performance, impressive comfort, good quality, a wide assortment of features, a fairly long list of advanced safety systems, better than average expected reliability, and reasonable value when comparing it to similarly equipped German competitors. It’s one of the smarter choices in its class. There was a time I couldn't understand why the Lexus RX sold so well. It was reliable, inoffensive to look at and finished fairly well inside, but there was no shortage of more alluring mid-size luxury crossover SUVs on the market. Now there are many more, albeit none more capable of eliciting reactions from passersby. If you haven't noticed this bit of origami folded metal rolling art recently you'd better pay more attention to your surroundings while driving. The RX is everywhere, not only in its stylishly overt new duds, but in its various old models' wallflower attire too. I know the latest version isn't to everyone's taste, but that's precisely why those who appreciate Lexus' daring new design direction are even more enamoured with the brand. In the U.S. Lexus is considered a Tier 1 luxury brand, along with Mercedes-Benz, BMW and Audi; we don't really have such a ranking, or at least I've never been able to find anything suggesting it. Strong sales numbers have a lot to do with their top-tier placement, but it also comes down to their near full range of models. For a relatively new brand, such a wide assortment of models and body styles means that some don't sell well enough to make much if any money, but instead provide important branding that trickles down to enhance higher volume cars and SUVs. 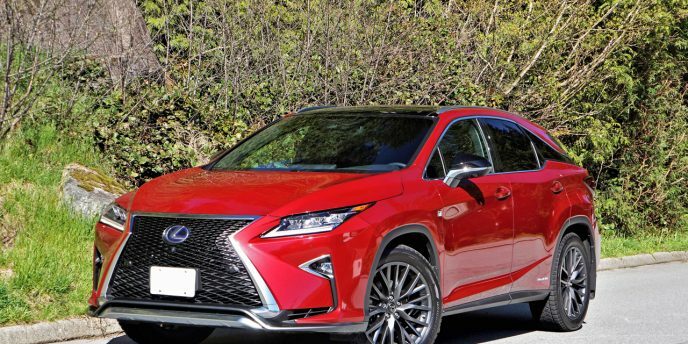 I was about to start this story by saying there has never been a more successful luxury SUV created than the Lexus RX, but after a little research I'm finding out that's an old, outdated statistic. The RX, which was the first car-based luxury crossover SUV ever produced, has been amazingly successful here in North America where it remains number one by a long shot, but within Canada alone it's currently second behind Audi's smaller albeit almost as accommodating Q5, while globally they both get beaten badly by Buick's number-one selling Envision that found 123,397 buyers worldwide during the first five months of 2017 (you can thank China for that), as well as Mercedes-Benz' GLC runner up that sold 117,856 global units over the same period. I don't have exact numbers for the RX in all the countries it's sold in because it didn't make the top 100 vehicles list. So much for starting out this review with a bang.